Once again the familiar refrain of “Danger Will Robinson” echoes in our ears thanks to Lost In Space. The latest Netflix series represents the third reboot of the classic 1968 Irwin Allen (The Time Tunnel, Voyage to the Bottom of the Sea) show, after a moderately successful turn on the big screen in 1998 and a failed 2004 reboot helmed by director John Woo. This marks a fairly traditional take on the original story, but with a few updates to character and story-line, and a couple of twists thrown in for good measure. With Earth slowly dying, many families seek to start a new life in an off-world colony. The Robinsons are part of the 24th colonial fleet, when an accident forces them to crash land on a strange alien world. Now the family must use their wits to survive the hostile new world, one where perhaps the most danger is represented by a newly discovered robotic life-form. Lost In Space remains true to the spirit of the original 60s TV show, but drills into the first few episodes, rather than the later high camp/ fantastical sci-fi that the show would become famous for. Here it is about survival in an alien landscape, and overcoming each issue as it occurs (at least in the short term, as many of these issues tend to snowball), drawing the Space Family Robinson closer to their Swiss Family Robinson roots. What this version does though is tweak the established characters, not merely modernising them, but fleshing them out. Each feels more solidly conceived (aided by the occasional Lost style flashback to add some more back-story), and as such the show becomes more reliant on character interplay, rather than external plot. Those character dynamics become a key factor in driving the action forward, and make us as an audience more invested in the family’s plight. It’s also a smart redesign of characters, jettisoning some of the basic social assumptions from the 60s. Maureen (Molly Parker) and John’s (Toby Stephens) relationship is not as solid as in the original, nor is the assumption of a patriarchal hierarchy seen as a given. 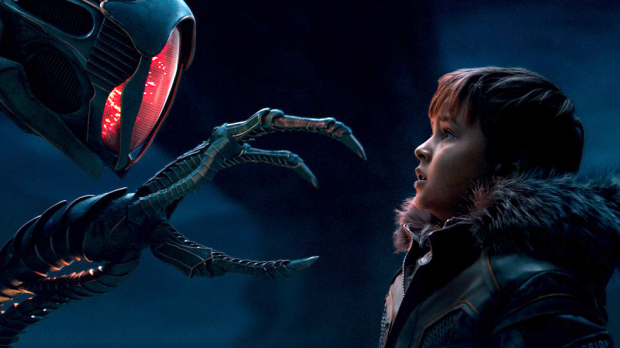 Judy (Taylor Russell) is handed far more agency, Penny (Mina Sundwall) is given a character, and Will (Maxwell Jenkins)… well Will is still pretty much the same old Will, but the “boy and his loyal dog” storyline is brought to the forefront (just substitute alien robotic life-form for dog). Then there is Doctor Smith and Don West. Both characters get a major overhaul. West (Ignacio Serricchio) is given a much more roguish bent, giving the character more life than the original incarnation. Smith (Parker Posey), is given layers of complexity, that are peeled away throughout the season. Posey does exceptionally well in revealing them, walking that line set by Jonathan Harris (a fan favourite from the original) in between conniver and coward, but never showing her hand too soon. The dynamic formed between Smith, Will and Maureen is much of what drives the show. The result is a solid sci-fi survival/adventure story, with great design and production quality, aimed at a more family-friendly demographic. In fact Lost In Space feels a little Spielberg in that manner, and it’s a comparison the show attempts to invite, with more than a few shout outs to the director’s work. In all Lost In Space doesn’t stretch the bounds of the genre, or focus on elaborate storytelling, rather it goes back to the property’s roots, updates them where needed, and produces decent family entertainment.